by Bob Gutierrez. Softbound, 32 pages, 8" x 11". 65 color photos. 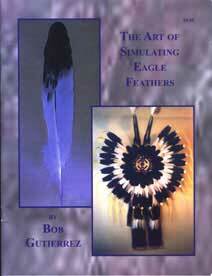 The only full color instruction manual which teaches crafters how to create realistic, imitation Golden and Bald Eagle feathers that can be legally used in all their projects. Includes photo-illustrated, step-by-step instructions, material lists and more.